The ongoing sensitization by the Delta State government for Deltans and residents with privately owned boreholes to test the sources of water supply for quality, may have met brick walls as there is low level of obedience. The state Commissioner for Water Resources, Sir Okenmor Fidelis Tilije, bemoaned that “the challenges have been very highly daunting but we will continue to advocate and sensitize Deltans on the need to support this program”. The Commissioner, who briefed journalists Monday at the ongoing Ministerial Press Briefing at the Ministry of Information, hinted that the World Health Organization recommended that all borehole water sources must be tested once every year. He noted that conformity to the directive has been a very serious challenge facing his Ministry, “compliance, few people are heeding, we are preparing to begin to sanction but we are holding on because we believe it is not a perspective of this smart agenda. It was clearer for us to try and carry everybody along before the sanction will come up. I deed mentioned that we are doing the best that we can to increase the advocacy, sensitization such that Deltans will buy into it and begin to understand where we are coming from”. According to him, the essence of testing your water is because government wants to collect revenue, “we have said earlier that the N5, 000 that is being paid by the individual homes, is actually a subsidized rate. The cost of testing any individual homes is about N10, 000. So, bringing it down to N5, 000 is to once again bring to bear the magnanimity of Senator Dr Ifeanyi Okowa, and at the same time ensuring that individual homes actually key into this programme”. 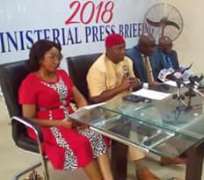 He however expressed hope that when the Delta State Water and Sanitization Bill is passed, “maybe the issue of sanction will begin to come up. The main essence of the law is to domesticate the relevant provisions of the National Water and Sanitation Policy/law and establish a comprehensive platform for the coordination of the implementation of water projects”.